Hawaii Vacation Rentals, Inc. accepts reservations via telephone and on line. We typically have a 5 day booking minimum. If you'd like to know more about any of our properties or would like to make a reservation, please complete the form below and you will be contacted. All information will be kept confidential. 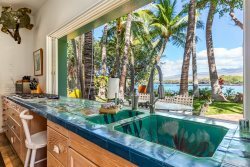 Hawaii Vacation Reservations, Puako Vacation Reservations, Kohala Vacation Reservations, Hawaii Real Estate, Hawaii Estate Management, Puako Real Estate, Kohala Real Estate.